One thing Ive learned the hard way threw several business deals and by trying to release my own distro is that you should not bash other distros, people, or companies that do you wrong. I know that there needs to be a place like the BBB where anyone can find out the truth about a business or organization. This is not my job. My job is to provide a product that people can use and tell what cool new features it has. Im even thinking about getting rid of my Microsoft bashing page. Of course Ill be thinking about that a lot before I do it. PayPal may have stole money from me but I didnt need to bash their company name by spreading the recordings over the Internet. I should have just reported it to the authorities like I already have and waited for a response. I do find it hard to apologize to PayPal for doing this because I dont feel like I owe them an apology. I almost bashed another community online because they rejected me. I decided to do this post instead. In the future I intend on just staying positive and leaving it to others that want to bash people. Im not saying its right Im just saying that word will get out. Justice will be served. Its just not my job to do it. 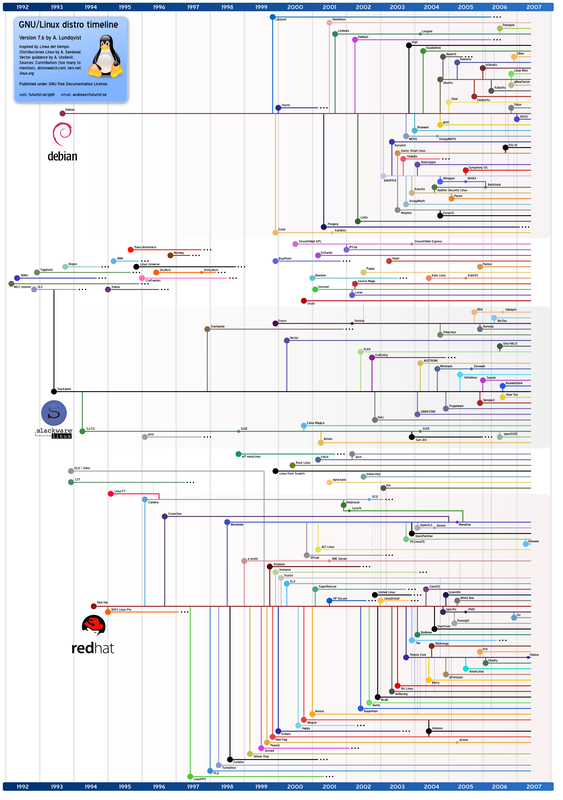 I know about the distro war that has been holding the Linux community back. Ubuntu is a prime example of this war. (not to bash them just for an example) Their community has made it clear to me several times that they should be the only distro for desktop users to clear up confusion between distros because their distro is the best one and its the easiest to use. This is the kind of attitude that will bring us all down. Do I believe that my distro is better than Ubuntu? Yes I do for the purpose of giving my customers what they want. Does Ubuntu have more hardware support? Yes. I would use Ubuntu if no other distro had the drivers I needed. But am I going to say that everyone should use it instead of all other distros and that all other distros should be out of the picture? NO! If it werent for Vixta I would have never gotten the idea for the interface, if it hadnt been for PCLinuxOS I would have never found a stable base, if it hadn’t been for Ubuntu I would have never understood the frustration people have been going threw trying to learn the new GUI (Gnome). I give all the credit for my project to the rest of the Linux community and Jesus Christ. The ideas I had for Ultumix didnt come from me. These ideas came from other distros and from the knowledge that God has given me. I am very thankful to be a part of something bigger and I dont ask for credit. All I ask is that you help support the project if you like the distro. Linux users have a couple complaints about my distro. One is the fact that all the icons for the most commonly used apps are on the desktop making it cluttered, another is that I have bad graphics, another complaint is that I dont give enough credit to PCLinuxOS. Windows users complained in the past that in Linux you cant find the programs your after (thats why I put them on the desktop). At this point I will accept any constructive criticism but before you complain please add a solution at the bottom of your complaint if you are a non-windows user. I think that one stable distro that can use all the packages from all distros should bring all the communities together. 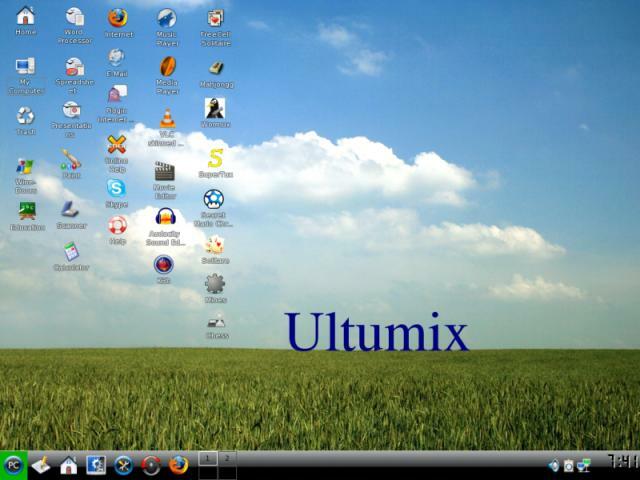 Ultumixs main goal in the beginning was to bring all the distros, repos, and package types together into one distro that everyone could use for whatever purpose they wanted. PCLinuxOS is just a very good base to start from because the packages are so stable and there is an acceptable amount of variety in their repos. The things that PCLinuxOS does not enable you to do threw the GUI is install RPM files downloaded from the net and install debain packages. I would not expect it to allow debian packages to work anyway and that is still a problem in Ultumix v0.0.0.4. 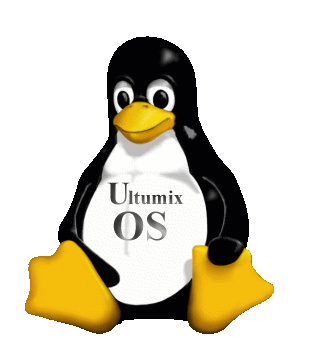 After getting all but one bug out of the system (the Grub picture) and making sure I didnt have any offensive non-free packages installed I released Ultumix v0.0.0.4. Some dont want me to call it a distro but rather a remaster of PCLinuxOS. Both are correct. Some say that I need to break away more from PCLinuxOS first and thats ok. They can call me a simple remaster until then if they like. Its like saying GNU/Linux or Linux. Does it matter? GNU/Linux contains GNU Software. Linux is the Kernel. Nuf said. Warning! This is what happens when you try to improve the PCLinuxOS distro and remaster it. Click here for a full view. I just got out from under PayPal with my new site. I have been PayPal / ebay Dependant when it came to getting users to buy on my website. I was also Yahoo page builder Dependant because I’m a lousy web page designer and no one will do it for me. I’m using Nvu now and Google Checkout to sell one type of laptop and 3 PCs. Yes I know I need to add more Laptops. I will get on that. In the mean time here is my new site. http://www.mindblowingidea.com/ComputerRescue . If you don’t buy from someone like me you are getting CEMENT = Vista. Believe me you don’t want cement in your PC. I know I don’t. PayPal calls me back and I confront them. The updated story is here. You will see the new info at the bottom. First of all I would like to remind you that either you, your forefathers, friends, or your next of kin have fought for our freedoms in different wars around the world. My Grandfather fought in World War II. My uncle fought in Vietnam. My friends in High School are now in Iraq. They are all fighting or have fought against an enemy they have seen first hand. These enemy’s fight with guns, spears, knives, cannons, etc. It’s easy to point out these enemies and stand against what they stand for. It’s not easy to see the enemies that are taking away our freedoms every day in the US without us knowing it. Most of them are in the white house, others are leaders of big corporations, but most of all the biggest enemy attacking our freedoms is public acceptance of these new restrictions either because of ignorance, unwillingness to read agreements before we sign them, or not knowing about any alternative way of life. Lets use Christianity as an example to start out with. Jesus came to this world, taught us his word, and gave his life for us so that we would in turn spread the word about him and help Jesus Christ to save others. Our country was founded on these principles. We were taught to accept this as truth and spread the word. The Government and big industry decided that it isn’t politically correct and restricted us in what we can say and do in public. Often times when you sign up for a job you agree not to offend any other coworkers by exposing them to your faith or you may agree not to practice religion in the work place and not even know it. As long as it’s not against the law to make these rules in an agreement they can stick them in there and get you to sign them without taking the time to read them. Lets look at another aspect of Christianity. When you spread the word of God often people argue with you, reject you, and call you a freak. Mostly this is related to just not wanting to think that there is a heaven or hell or that their religion could be wrong, and this is ok. Everyone is entitled to think that and if they want to then they will discover that Hell exists when they are burning. There is nothing more I can do besides pray. Here is another example. We have a president named George Bush. He is just waiting for an excuse to start a war. 9/11 happens and we hand over all control to him. We trusted him as a leader. For some reason we can’t get him to stop or at least do it right. After 9/11 more and more of our freedoms have been handed over to the Government that give them a God like control over us. They listen to all our phone conversations, they can monitor our windows PCs, and they won’t let us fly on an airplane with anything that might be dangerous. Now that you understand the basics of what I’m trying to show you I will take you to the next level. This is where some of you would normally say I am just paranoid but after getting you in a more open mindset hopefully you will digest this correctly without upsetting your tummies too much. What if there was a way to control all means of communication? What if there was a way to say what you could and could not transmit over the Internet? What if there was a way to exclude the word of God from being read? What if we could regulate what could be said on TV, Radio, and in the news? What if we could regulate what any American can have stored in their own house as far as data and monitor what it is? Well welcome to Revelations. What I’m going to do is tell you about the tools that are at our disposal now to make this a reality and what already is a reality. Lets start with the telephone. The telephone is not recorded all the time. No one could do this except maybe China because it requires too many super computers and too much storage. What is done is your phones are monitored and if any key words flag the system such as kill, terrorist, or other words then the Government will start paying attention to you and possibly record you. This system has existed for a very long time. It helps also when trying to track you down. Lets say you get accused and the government wants to keep track of you or hunt you down. All they have to do is program the super computers to listen for your voice type, name, and other info and tell them the location of the phone you are calling from. Then they can use satellites in the sky to try to look down on you and see what is going on or maybe they use aircraft that are flying very high in the sky overhead. Your credit cards are then monitored for use and so are your bank accounts. Basically everywhere you go they can find you. Your PC. Perhaps the best device for keeping track of you and what you are doing is your PC. It is a known fact that China will not use Windows Vista at all because it enables Microsoft to monitor their computers and they have to agree to those terms to use Vista. China is afraid the US will find out their secrets. Windows Vista uses half of your Internet speed and half of your PC’s power to monitor what you are doing and send the data back to Microsoft. Microsoft tells you this before you ever use the software. I know this is a lot to read but like I said would you rather read this or give away all your freedoms that your forefathers fought for? If you are still reading then you are no longer ignorant to the fact that you are signing your life away to Microsoft. These terms and conditions apply to XP to when you install newer Microsoft products and agree to the agreement. So now you see how the Government can use these tools to restrict communication and privacy. You probably thought I was crazy at first but after reading the agreement above understood what I was saying to you. This is what I was talking about when I was referring to spreading the word of God and people thinking you are a freak or a nut. It’s the same thing. When I tell people about Linux they have the same reaction. Jesus died so that we would spread his word all over the earth. By using Linux you are only obligated to tell others about it too. As far as I’m concerned if Linux protects us against this agreement it also insures that we will be able to continue the spread of the gospel. Microsoft plans to take over the Internet and the phone companies at the same time. Microsoft is trying to get people to stop using telephones and start using their phone software on their PCs the same way I use Skype. Microsoft also wants to buy out AT&T and other country wide phone networks. Then Microsoft can control the Internet. Microsoft will get this control the same way they got the right to monitor everything on your computer. Microsoft convinced the Government that it needed to monitor us to make sure we were not pirating software, music, DVDs, or other stuff on our PCs. Microsoft also wants to filter the Internet the same way. If Microsoft succeeds or should I say when Microsoft succeeds downloading things like Linux CDs and programs for Linux and Mac will not be allowed because they could contain stolen software. Microsoft already claims that Linux is stolen because they claim to have wrote the code. They can’t win in court but if they impose a restriction on us who is to say that anyone will stop them? Other countries are taking a stand like Europe and France but the US is still stuck with it’s head in Micro$oft. Because of the problem earlier I described where Micro$oft could not sell to China they decided to give away Vista Ultimate for $7.00 a copy to try to get the Chinese hooked on it. They also said to the Government of China that they would turn their backs on pirating. This was in the e-week magazine from Micro$oft. Thats where I found out. So you tell me is it worth reading these agreements? Is it worth protecting our freedoms our forefathers fought for? You tell me. How to get the Micro$oft out of your Windows XP computer in a couple easy steps! Video Demo best seen in full screen. First of all why do this? Well it is a known fact that without Internet Explorer, Outlook, and some other Micro$oft components your PC should be Virus free. Also Microsoft is monitoring what you are doing and indexing your files on your PC. After you do this they won’t be able to do that any more. You should be aware though that you agreed to let Microsoft do this when you installed any of their newer software packages like Office 2007 or One Care. Important: before you do this click start, and Right Click on My Computer and hit properties. Make sure automatic updates are turned off. Go to www.firefox.com, download and install it. Go to www.mozilla.com, download and install Mozilla Thunderbird. Go to www.download.com, download VLC player and Media Monkey Player, Install them as well. Reboot and go into Safe mode by pressing F8 several times durring boot up. Click Start, Control Panel, Add Remove Programs, Add Remove Windows Components. Remove Internet Explorer, Outlook Express, and Windows Media Player. They are not gone yet. After removing them get out of all of that and click Start, My Comptuer, C:, Program Files, Internet Explorer. At this time click Tools, Folder Options, and View. Now go threw the list and check all items that start with Display, Uncheck all items that start with Hide and click Show hidden files and folders. Click Apply and then OK.
You will now see more files than before. Without closing this window for Internet Explorer click Start, My Computer, C:, Program Files, Mozilla Firefox, click Edit, Select All, Edit, Copy. Now click back on your Internet Explorer Window and hit Edit, Paste. Go back to the Mozilla Firefox folder. Copy firefox.exe to the desktop (do not create a shortcut), right click on it and rename it to IEXPLORER.EXE. Copy it into the Internet Explorer folder over top of the existing IEXPLORER.EXE file. You have just gotten rid of Internet Explorer for good. Do the same for Outlook by replacing it with Mozilla Thunderbird, Replace Windows Media Player with VLC or Media Monkey. Whichever you like. Reboot and it will all work just fine. DO NOT DO ANY WINDOWS UPDATES THREW www.windowsupdate.com. Use Windiz updates to update in firefox. Go to http://windowsupdate.62nds.com/ and then copy a shortcut to the site to the desktop. Rename another .exe file such as firefox.exe to wupdmgr.exe and copy it over wupdmgr.exe in C:, Windows, System32. You may also wish to replace wuauclt1.exe and wuauclt.exe as well. This may cause firefox to pop up unexpectantly but it will block Windows Update. Now download and install Avast, Spybot, and Clamwin. After you configure them to autoprotect and update you are done. You should not get any more viruses. DO NOT! Install Microsoft Office 2007, One Care, Windows Media Player 11 or any other Micro$oft software from Micro$oft. To Disable those annoying balloons at the bottom of the screen that want you to turn on automatic updates. Pay Pal is lieing on the internet in their agreement. I will attach the current agreement. NEW UPDATED INFO AT THE BOTTOM! Yes thats right I caught PayPal in a direct lie. (Listen Live Here) First of all let me give a brief summery of my agony. I have been selling laptops for quite some time now. I got my first PayPal account about 10 years ago under the name jcb-wizard@pomeroy-wa.com . This account no longer exists. Back then they just started seller protection and there were no limitations in the user agreement. I agreed to that agreement. Since then this agreement has been reshaped to say that if you don’t meet within a vary narrow set of instructions you are not protected. I also have received e-mails from PayPal stating that I am 100% covered against any fraud through FDIC insurance. The new agreement says that this is pass through insurance. What is that? Doesn’t matter because when I called them on the phone and recorded it here they told me I am currently protected 100% against any fraud through FDIC insurance. Then they turned around and told me it would not cover me in my case. What is my case? Well I sold a laptop to a guy and he was in Indonesia. When I checked his address it said it was verified! What a screw up. I don’t have proof that I saw that but thats what came up. The money was deposited by PayPal into my checking account and I let it set there for over 3 days. I shipped the laptop and the very next day they told me that the guy stole someone’s account in the USA. They then asked me for my tracking number and all the usual information. Then they told me I owed them for the laptop. They are negligent in trying to get my laptop back at all. They made no effort at all. So getting back to the phone call, they told me that they never changed the user agreement for seller protection and then went on to say that they just started it 10 years ago. So they had to have changed it. They even admitted that they did. Can’t they get their facts straight? DON’T DO PAYPAL! If you are still with me here we are not done. A buyer bought another laptop from me right after this took place because it was still listed on eBay. He lives in Auburn WA. I shipped the laptop to his confirmed address and according to eBay’s contract he signed (eBay owns PayPal) there is no return or refund unless it’s broken, DOA, or not as described. He didn’t even open the package. He returned it to sender and guess what? PayPal wants me to pay for all the parts I put in that thing and the laptop even though I can’t send them back and get a refund for them without a 15% restocking fee. Now PayPal won’t answer the phone if I call from my phone number any more. Their automated system automatically hangs up on me. I e-mail them but all they say is you don’t qualify for seller protection. The BBB has given up on them all together and has collected 5200+ complaints in the last 3 years. I’m going to call the WA State Insurance commissioner and see if he can help me. The problem is that they are training at the moment so you can’t call them. Their number is 1-800-551-4636. News Update: I just got threw to the WA State Insurance commissioner’s office and they redirected me to their website. I’m filing a complaint and directing them to this Blog Post to read the documentation. As stated in my phone recording podcast I requested that PayPal take my account balance to $0.00 and close the account but because they have failed to comply I now ask that they also refund me for the full amount of what they deducted from my account ($1,799.20) and pay me back the service charges that were imposed on my account ($55.87) that were suppose to insure my protection which I did not receive. These amounts total ($1,855.07) However, since I have not been able to sell goods with eBay and PayPal due to the fact that they would take all the money and I would not be able to pay my suppliers for my supplies to make computers I have lost a lot of business. I would like to be compensated for this business I have lost. The data here shows that eBay confirmed a lot of transactions that PayPal did not. My growth as a business is shown by this equation Money = -1221.981 + 32.729557*Days where Y is Money and X is the number of Days. This model is an estimate based on the equation above and the previous data. According to this data by the end of October 2007 PayPal will owe me $4,856.66 for compensation. I am not asking for this amount because I know that it would be expecting too much from PayPal. I plan to have another Merchant Account set up with US Bank by November. What I am asking for is a total of $4,000.00 of credit to my PayPal account to reverse the negative balance, pay me back for the fees they incurred, and lastly for business loss. This Christmas I would like to be able to get something for my friends and family like I do every Christmas, and I would also like to continue teaching my free computer lab, but if PayPal decides to take that away from me and WA state decides to then I will take any advice they have to try to defy debt. eBay owns PayPal and eBay rejects Google’s Checkout program as listed here. Is this similar to the Micro$oft Monopoly? I think so. Is it unconstitutional? I think yes. PayPalUserAgreement in .pdf format here.